CD Projekt RED ticked off a few gamers today by revealing exclusive items for the Xbox One version of The Witcher 3. Their angry reaction prompted CD Projekt to explain their decision. The exclusive bonuses for Xbox One aren't in-game content. Instead, they're physical extras for the Witcher 3 Collector's Edition. The Xbox One version of the CE comes with a cloth map of the game world along with two decks for the card game Gwent. Gwent is a card game that also appears within Witcher 3, with players battling head-to-head using spell and character cards. "What is the reason? Why are we doing this? We need the support of partners to make our game visible worldwide," the developer said in a statement to Eurogamer. "This should hopefully translate to better sales, which will in consequence allow us to do what we have been doing for the last 10 years, i.e. reinvest this money to make more great RPGs, while still sticking to our values." These extras don't sound all that enticing. After all, they're limited to a £139.99 Collector's Edition that most gamers wouldn't buy anyway. Also, the exclusivity's apparently limited to Europe because the items aren't mentioned in the North American listings of the CE at all. The principle of the Xbox One getting something that the PS4 and PC didn't was enough to rile up gamers, though. Some of these angry gamers created a petition demanding that the map and card decks be released on all platforms. I think the backlash was partly driven by expectations. CD Projekt has distinguished itself as being very gamer-friendly in the past due to their stances against premium DLC and DRM. These collector's edition items are small exclusives, to be sure, but gamers were just surprised to see a company with CD Projekt's reputation engaging in the practice. CD Projekt RED further defended their decision about the Collector's Edition by pointing out that they're not making DLC or any other gameplay content exclusive to one platform or another. They also pointed out that in the past they've announced several pre-order bonuses, ranging from comic books to posters, without any protest from fans. "If you still consider that adding two decks of Gwent cards and a map of the in-game world to the Xbox One CE equals us betraying our values and not fulfilling our promises, well, it does make us sad, but the final call is always yours to make. Still, I do hope that what we offer is unique and we can ask you to give us the benefit of the doubt. We have more great things to announce for The Witcher 3: Wild Hunt in the coming months and I promise you won't be disappointed (yes, yes, there are no more exclusives coming)." 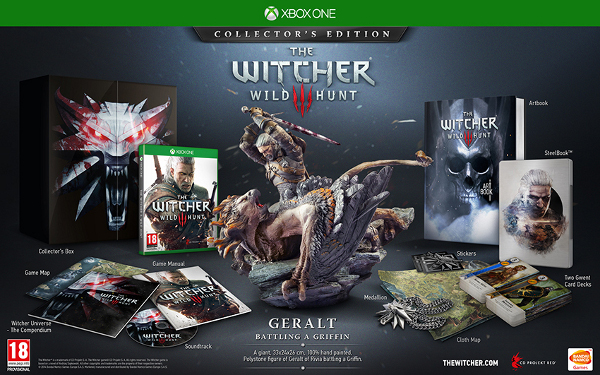 The Collector's Edition also comes with a medallion artbook, statue of Geralt fighting a Griffin and a SteelBook case. The bundle includes the standard edition extras as well, like the official soundtrack and written guide to the game world. Witcher 3 will launch on all platforms on February 24th. You can check out the latest trailer from GamesCom here.